Looking at the league table following the 1-1 draw from the Spurs v Chelsea game last night, things appear to be shaping up quite nicely for us. We're still in fifth position following our win at Villla but now a point behind Chelsea and three behind Spurs, who still have a game in hand (Everton at home) over all their rivals. Whilst I'd rather us be sitting within the Champions League spots, with two home games against Wolves and QPR to go until we're half way through the season and with the trip to Fulham to follow on January 2, things can only be described as being a lot better following our awful start to the season. Our next three fixtures come in quick succession - Wolves visit the Grove (which has now been put back 24 hours to Tuesday December 27 with a 3pm kick off because of the tube strike) then four days later at home fixture with QPR then two days later a trip to South West London to take on Fulham. But you would expect us to get all nine points from the three fixtures. All look to be very winnable and with the team being in the form it is, you would expect that the manager has set his sights on us winning all three games. Where as in previous season I would worry about us not having the right attitude when approaching these fixtures - some players seemed to believe we'd win the match by just walking out on to the pitch - this team seem to have a lot more about them to know that they will have to put in a shift to win any Premier League game. When you saw Samir Nasri just flit around the edges of games when he didn't appear to care whether he was involved or not, when if he'd got more involved and demanded the ball, perhaps we wouldn't have faltered so much in the second half of last season. And he wasn't the only player. Some still at the club appeared to have that attitude. But it appears with more experienced heads around them they're being brought into line about what kind of attitude is expected at Arsenal. Van Persie has proved to be a good choice as captain. And he's got players around him who won't accept anything less than 100 per cent on the pitch. Vermaelen, Arteta, Mertesacker, Benayoun have got the attitude we'd expect. Even younger players like Szczesny and Wilshere know what's expected of them already and won't take any prisoners if something needed to be said. I don't think I can fault the attitude of this team and I imagine it's one of the reasons why van Persie has been in such a rich vein of form in front of goal. He knows that he's got the support around him to take a chance on a shot where as before he'd be under pressure to convert every chance he gets. Knowing that he's got a player like Gervinho around him who creates key passes with ease, Robin knows that he'll get more than one opportunity to score. And with him equalling Theirry Henry's record of 34 goals in a calendar year and with just three more to bag with two games to go in 2011 to better Alan Shearer's record, the games against Wolves and QPR have given our prolific Dutch striker something to aim for. "Anything can happen in this league. Results early on [show that]. Our result against Man United was a surprise, our result away at Chelsea was a big surprise, and Manchester City winning 6-1 away at United too. Anything is possible. "The way we look at it is that we challenge for every single game. I don’t think Man City or Man United are thinking about [winning it now] because it is only 17 games played. You just have to look at it from game to game." With Manchester City 12 points ahead and looking very strong, I think it's slightly beyond us to win the league this season. But I think we've certainly got a chance of bagging third place. The captain has also praised his new team mates for their quick assimilation into the Arsenal way of life. And whilst praise is certainly due for those new signings, one of the reasons why they've quickly adapted to life in north London is because of the bonding sessions RVP has organised. One of those who has come in and made an impression more at the training ground than in matches because he's yet to start a league game is Yossi Benayoun. It's clear he's made the right impression with his team mates as they all appear to get on well with him. And I think his signing might prove to be a good one come the end of the season. But as you'd hope with a player who isn't playing regularly, he's getting frustrated. No wonder he was so pleased to score on Wednesday night. "I don't know if I felt the goal was coming, but every time I get the chance to play I'm doing my best. "I didn't play in the last two games and of course you get a bit frustrated. You wait for your chance and I'm glad I scored the winner." RVP has said the rest of the team were happy to see the Israeli get his third Arsenal goal as well. You wonder come January who the manager has in mind to replace Gervinho in the starting 11. 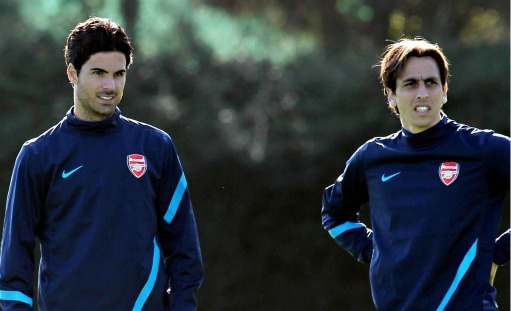 Benayoun is an option along with Tomas Rosicky. And the elephant in the room at the moment in Andrey Arshavin, who cannot seem to play his way into any sort of form. There was talk of Wenger listening to offers for the Russian in January. His former club Zenit St Petersburg have said they are interested in him. Whether an offer will materialise is another thing. The Daily Mail believe that Kieran Gibbs is out of action for another four weeks following his latest set-back and this could force the manager into the transfer market. The best name they can come up with is Wayne Bridge. I hope that isn't someone who Arsene is seriously looking at considering how woeful he was at West Ham last season. And finally, a bit of transfer tittle tattle. We're in a three-way battle with Manchester United and Fiorentina for Anderlecht midfielder Lucas Biglia, his agent tells the Daily Mail. The Argentine midfielder has been watched by us in recent months according to the paper. We'll wait for Arsene to shoot it down before getting our hopes up.